This Video Of Cop Attempting To Arrest Pair Of Cows Is The Funniest Thing You’ll See Today! 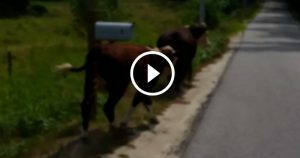 Officer Ernest MacVane of the Windham Police Department made the video of an attempted arrest of two young cows that escaped and wandered onto a road late last week. After receiving a call about cows attacking vehicles on a country road, Mr MacVane went to investigate. He said he made cell phone video for his 10-year-old son, but it went viral after the department posted it on Facebook. After realising the cows weren’t going to comply, he does his best to move them along – but the criminal cows soon start running. As well as entertaining his 10-year-old son, Mr MacVane’s video entertains people too.